A collaborative group consisting of Masahiro Yamamoto, a researcher at the R&D Centre of the Japan Agency for Marine Earth Science and Technology (JAMSTEC; President Asahiko Taira) and Ryuhei Nakamura, a team leader at the RIKEN Center for Sustainable Resource Science, conducted in situ electrochemical measurements at the deep-sea floor hydrothermal vents in the Okinawa trough. This group proved that power generation phenomena occurred naturally around these vents. Hot water, called as “hydrothermal fluid”, discharged from the deep sea hydrothermal vent contains abundant reductive gases such as hydrogen sulfide, and metal ions such as iron and copper. The hydrothermal fluid is rapidly cooled by seawater and precipitates sulfide minerals, forming a submarine hydrothermal deposit in the surrounding area. By conducting electrochemical analysis of these sulfide mineral deposits at the site and in the laboratory, the research group demonstrated that transfer of electrons occurs from the hydrothermal fluid under the seabed through the sulfide minerals to the seawater. This means that an electric current is generated. This power generation is observed on the mineral surface for at least about one hundred meters around the hydrothermal vent. In other words, the deep sea hydrothermal vent region functions as a huge natural fuel cell, where current is continuously generated. 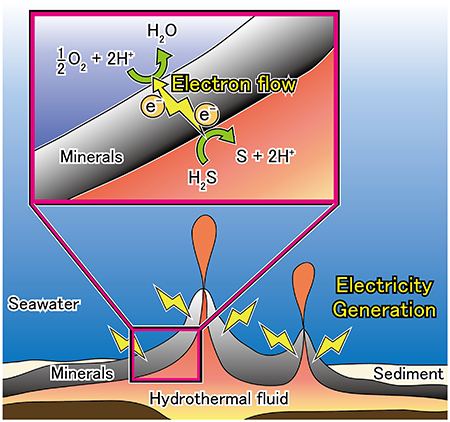 The deep-sea energy flow and material cycle that had hitherto been thought to depend only on molecular diffusion has now been shown to occur through electric current in mineral deposits. It is therefore necessary to re orient our thinking both spatially and mechanically, and, as understanding progresses, the application and development of this concept in various fields can be expected in future. For example, considering the possibility of an expanding ecosystem on the ocean floor that uses electricity as an energy source or the possibility that life forms were generated in ancient times by electric power in deep-sea hydrothermal vents on the earth could dramatically change the methods for the exploration of extra-terrestrial life. The result of this research will be published in the Angewandte Chemie International Edition of the German Chemical Society on May 10 (JST). The paper has also been adopted as its cover picture of the issue. 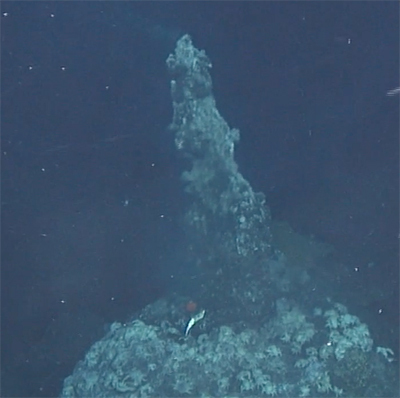 HDSK chimney in the Iheya North Aki field, Okinawa Trough. 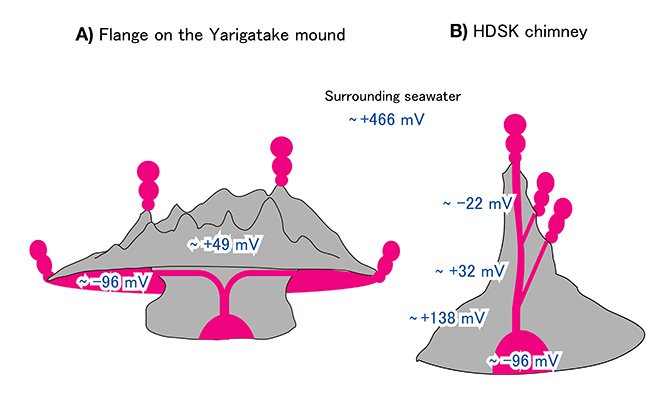 Water depth is 1,071 m; height of the chimney is approximately 6 m.
A) Yarigatake mound flange (Iheya North Natsu field), B) HDSK Chimney (Iheya North Aki field). Grey indicates mineral sulfide and pink indicates hydrothermal fluid. The HDSK chimney is located at the centre (origin) of the seabed topographic map. 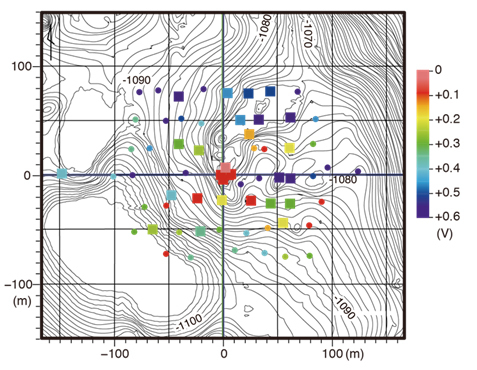 The coloured squares and circles represent redox potentials of the mineral surface (outcrop) and in the sediment, respectively. Hydrothermal fluid under the seabed contains large amounts of hydrogen sulfide, which functions as a reducing agent (releases electrons). Mineral sulfides, which form a major component of seabed deposits, function as electrode catalysts and conductors. Electrons from the hydrogen sulfide in fluid are transmitted to the mineral sulfides, through which they flow, and are transferred to the oxygen contained in the seawater on the ocean floor.